Attended by the enthusiastic and erudite batch of future HR managers, eminent leaders from different industries participated in the event. 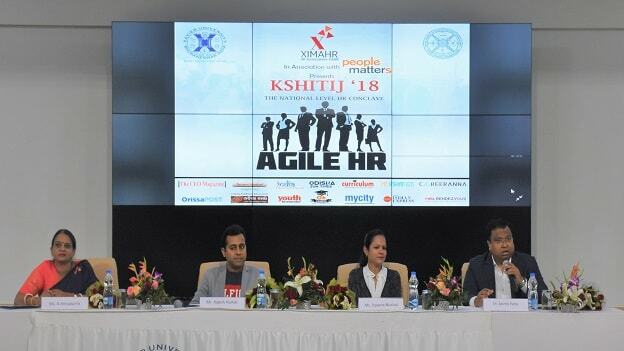 Xavier School of Human Resource Management (XAHR) in collaboration with the HR Association of XAHR (XIMAHR) of Xavier University, Bhubaneswar (XUB) hosted its annual business conclave, Kshitij. The conclave aimed at providing the students of Human Resource Management (HRM) a comprehensive view of “Agile HR,” which was the theme for the event. Attended by the enthusiastic and erudite batch of future HR managers, eminent leaders from different industries participated in the event. The speakers for the session were Upasna Nischal (Global Head - Talent Management, ACC, Evalueserve) Rajesh Hurkat (Head HR, Mattel India) and Annapurna A (Director - Human Resources, Inspirage). The speakers, along with Dr. Sasmit Patra (Associate Dean, International Programmes), Dr. Andrew Dutta (Associate Dean, XAHR) and Dr. Arup Roy Chowdhury (Assistant Professor, XAHR), inaugurated the conclave and elucidated briefly how the theme is important and should be widely discussed. Dr. Andrew Dutta opened the forum with his welcome address by stating that Kshitij is a prestigious, student-driven HR conclave which aims at the creation of finest HR stalwarts. Prof. Arup Roy Chowdhury also addressed the audience by defining the need for a robust HR system in the present-day complex and ambiguous nature of the industry. He expressed Agile HR as a function of anticipation, innovation, responsiveness, collaboration and execution of HR practices. Dr. Sasmit Patra, the moderator of the discussion, in his address called for shifting the conventional form of panel discussion towards a more agile approach. The first speaker for the panel was Upasna Nischal, who stressed the need to go beyond classroom education. She also iterated that technology, political scenarios, and demographics have been the “movers & shakers” of the HR industry. She reinterpreted the VUCA (Volatile, Uncertain, Complex, Ambiguous) world as VUCA - Vision, Understanding, Collaboration, Adaptability for success. The second speaker, Annapurna A focused on developing curiosity, humility and collaborative abilities in an HR manager. She also endorsed the inclusion of design thinking as an essential course in every MBA college’s curriculum. Rajesh Hurkat spoke next about how to overcome the hindrance of laws and regulations while executing Agile HR strategies. He also suggested that one should customize their Agile framework instead of following any template. This event also marked the release of the 12th edition of “HRXpert,” an annual magazine by XIMAHR. NEXT STORY: Find your Purpose, because Passion is Overrated!